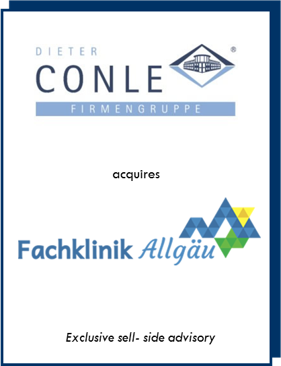 The Acura Fachklinik Allgäu has been acquired by the Dieter Conle Group based in the neighboring city Sonthofen. So all 150 jobs as well as the accommodation of 200 patients have been secured. The Conle Group, which originally has its roots in the real estate industry, operates 18 nursing homes, two clinics and three home health care services all over Germany. 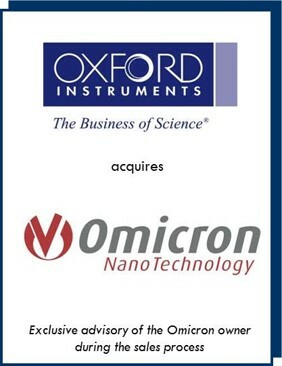 Oxford Instruments plc, a provider of high technology tools and systems for industry and research, has acquired Omicron NanoTechnology GmbH (together with its subsidiaries, “Omicron”) and Omniprobe, Inc. (“Omniprobe”) for a cash consideration of €32.4 million on a cash free debt free basis, to include land and buildings valued at € 5.0 million. Together with the Omicron subsidiaries in the UK, USA, Japan and France, that design and produce advanced microscopes and chemical analysis instruments for nanotechnology research they will build the business unit Nanotechnology Tools. 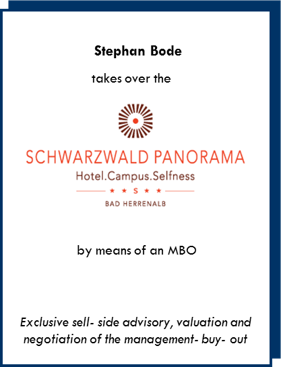 Within the framework of the restructuring process of the Ruland Group, the associated Schwarzwald Panorama Hotel was acquired by its managing director Stephan Bode in form of an MBO. The award winning 4*S house with 100 rooms, 75 employees and an overall concept based on sustainability, offers a high level feel-good atmosphere to conference guests and demanding individual tourists alike. 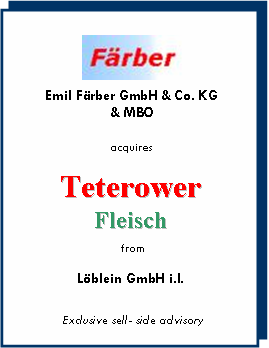 On behalf of the insolvent holding company Löblein, the subsidiary Teterower Fleisch has been sold to a team of investors consisting of the owner of Färber and an MBO Team. The privatisation of the institute of grain processing seemed futile after several trials. Especially the need for security of public institutions could not be contractually combined with a pure Management-Buy-Out. After 18 months of negotiations, specific solutions for the individual parties have been found and rendered the privatisation possible. 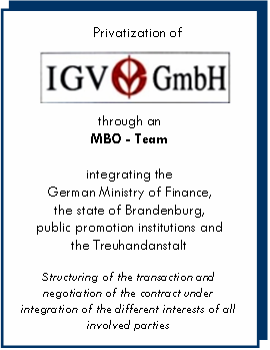 The ongoing business of IGV has now shown extremely positive results. 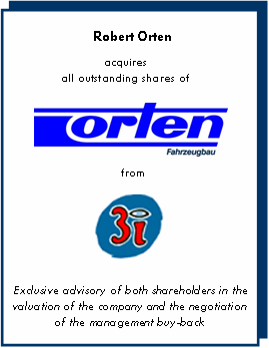 Within the scope of the Management – Buy – Back of Mr Orten a fair value for both sides has been established. Steering the ensuing negotiations both parties have been intensively coached on their different scenarios. By using several financing tools, a swift settlement was attained. 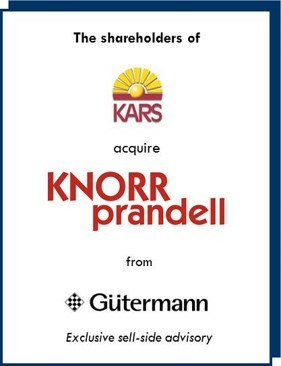 As a result of focusing on its core business, Gütermann SE has divested its crafts business and sold its two subsidiaries KnorrPrandell (Germany) und Bastel Service (Switzerland) to the Dutch crafts retailer Kars & Co, Ochten. This takeover forms the largest and most important hobby and crafts retailer in Europe. 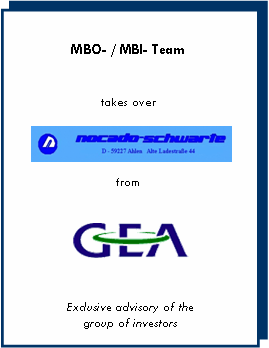 Within the scope of an MBO/ MBI, GEA sold its strategically unimportant subsidiary, a manufacturer of milk collection lorries. The focus was on the optimization of the transaction structure and the contract of sale.